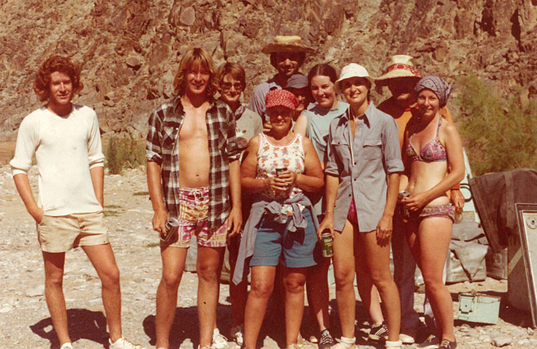 Caught with her funny companion, Erma Bombeck, on that morbidly hot August day in the depths of the Grand Canyon, without a smidge of shade or water, the picture was grim for these two dear friends…as grim as the Reaper. The next thing they knew, their knees buckled and they hit the sand, as if an old miner had “knocked ‘em over with his pick ax.” This was followed by their stomachs tossing up whatever fluid they had left in their dried-out bodies. Seasickness in the sand. Not good. Gasping for air, they rolled under a craggy crag from which a scorpion skittered and quietly groaned for a moment in unison. That’s when Erma mumbled her obit. I can see the headlines now…”she rolled her eyes with devilish intent: ‘Famous Humorist, Newspaper Columnist and TV Celebrity Dies on Trail with Little Unknown Person. And it was then and there that Lorraine said in a promise to God that if he/she let her live, that “I swear I’m going to write a book.” And Erma agreed that if she died first, Lorraine could write a book. And lo and behold, the book’s title would be “A Nobody in a Somebody World.” Lorraine says that the great thing about being anonymous is that an unknown us can walk among us while quietly gathering mundane material and then retell everything after the main subjects die or they are too old to recognize their names. You will learn what it’s like to grow-up as a non-celeb in Beverly Hills and then end up in the film business where your husband produces two of the worst movies ever with Oscar-winning stars. You will follow her in her garden as she relives a photo shoot gone terribly wrong for a feature in the Ladies Home Journal magazine. This experience is trumped by the nationally publicized event of hundreds of frenzied Iranian rioters destroying her front yard with tornado-like intensity. Find out why. And then read along as her reputation is destroyed by her appearance on a #1 game show. 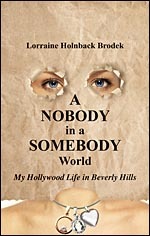 This is a book that shows truth is way funnier than fiction and that a “little unknown person” can turn her crazy, sometimes bawdy, amazing stories into a wonderful collection all bound together in “A Nobody in a Somebody World.” Enjoy. Click to see more photos of my life as a Hollywood “nobody” in this gallery.